This article is a direct translation of nampiLLai's avathArikai (introduction) for poigai AzhwAr's mudhal thiruvanthAdhi. Thanks to srI U. vE. M A vEnkatakrishNan swamy's monumental effort in locating these vyAkyAnams of nampiLLai and publishing the same and also providing easy to follow thamizh explanation for these wonderful commentaries. The first three AzhwArs (poigai AzhwAr, bhUthathAzhwAr, pEyAzhwAr) were fully realised (by the grace of emperumAn) in bhagavath vishayam. Their living in samsAram (material world) is like mukthas (who were once in samsAram but ascended to paramapadham and whose knowledge is fully blossomed in paramapadham) descended and lived in samsAram (material world), They were also the ones who were the first to be indulged in bhagavath vishayam. Since they are involved in bhagavath vishayam more than other AzhwArs, these three AzhwArs are considered similar to nithyasUris (eternal associates of bhagavAn in paramapadham). nammAzhwAr glorifies mudhalAzhwArgaL in thiruvAimozhi 7.9.6 as "inkavi pAdum parama kavigaL" (இன்கவி பாடும் பரம கவிகள் - the supreme poets who sing sweet poems) and thirumangai AzhwAr glorifies them in periya thirumozhi 2.8.2 as "chenthamizh pAduvAr" (செந்தமிழ் பாடுவார் - ones who sing in pure thamizh). 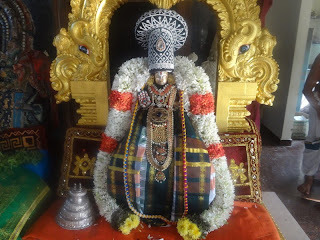 They were greatly attached to different manifestations of emperumAn such as parthvam to archAvathAram (http://ponnadi.blogspot.in/2012/10/archavathara-anubhavam-parathvadhi.html) and their knowledge and devotion were spread over these different manifestations. Yet, just like during floods river will have water all over but will run towards a particular place, their focus is more specifically on thrivikrama avathAram (in vibhavAvathArams) and thiruvEnkatamudaiyAn (in archAvathArams). thirumangai AzhwAr explains in periya thirumozhi 11.8.9 pAsuram as follows. "An vidaiyEzh anRadarththArkku ALAnAr allAthAr mAnidavar allar enRu en manaththE vaiththEn" (ஆன் விடையேழ் அன்றடர்த்தார்க்கு ஆளானார் அல்லாதார் மானிடவர் அல்லர் என்று என் மனத்தே வைத்தேன்) - Even though born as humans, if one does not become devoted to krishNa (who killed the 7 bulls), I will not even consider them as humans. The ones who dont have servitude towards bhagavAn are not even considered as humans by mudhalAzhwArs. By saying "en manaththE vaiththEn" (என் மனத்தே வைத்தேன்) - "I consider like this" emphasises the following aspect - sarvEsvaran is so merciful yet svathanthran (totally independent) - so there is no wonder if he refuses to uplift them. But AzhwArs are so merciful that they will even grace and uplift the ones who are given up by bhagavAn himself - even after being an AzhwAr, they are going to reject such persons who have no desire towards emperumAn. So, it is written on stone and copper plate that those who do not have attachment towards bhagavAn is not to be considered as humans. 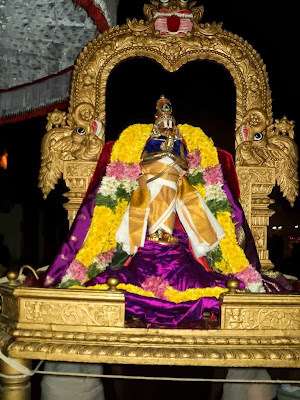 kulasEkara AzhwAr says in perumAL thirumozhi 3.8 "pEyarE enakku yAvarum yAnumOr pEyanE yavarkkum" (பேயரே எனக்கு யாவரும் யானுமோர் பேயனே யவர்க்கும்). Whoever is not engaged in bhagavath vishayam, they look strange to me. Since I am not like them (engaged in mundane pleasures), I look strange to them. As mentioned in iraNdAm thiruvanthAdhi 44 "chiRanthArkku ezhuthuNaiyAm chengaNmAl nAmam maRanthArai mAnidamA vaiyEn" (சிறந்தார்க்கு எழுதுணையாம் செங்கண்மால் நாமம் மறந்தாரை மானிடமா வையேன்) - these AzhwArs (mudhalAzhwArs) dont even consider the ones who are not devoted to bhagavAn as civilized. So, they considered it is better to live in forests (where there is less people) than living amidst such persons who have hatred towards bhagavAn even after being born as humans with intelligence. Even there, they were not attached to a single place - wherever they in the evening, they spent the night there and were roaming around separately without knowing each other. By divine arrangement, all 3 AzhwArs arrive at thirukkOvalUr region on a stormy day. First poigai AzhwAr enters an idaikazhi (veranda/porch of mrugaNdu maharishi's hut). bhUthathAzhwAr arrives subsequently and knocks the door. poigai AzhwAr says from inside "I am lying down here and there is no more room". bhUthathAzhwAr replies "If one person can lie down, that place should be sufficient for two persons to sit. So, please open the door". Hearing this, poigai AzhwAr thinks "In this samsAram, whre most persons dont like to be touched by another person's breath (dont want close proximity with strangers), if this person says like this he must not be an ordinary person" and opens the door and they both are seated comfortably. At that time, pEyAzhwAr arrives there and knocks the door. They both now say "We are two persons sitting here, there is no more room" and pEyAzhwAr replies from outside that "If two persons are sitting, 3 persons can stand there". Understanding that, he is not an ordinary person either, they let him in and all three of them stand comfortably. At that time, as said in mudhal thiruvanthAdhi 86 "nIyum thirumagaLum ninRAyAl" (நீயும் திருமகளும் நின்றாயால் - If the most merciful emperumAn and pirAtti are present together), sarvEsvaran arrives with his divine consort and joins them and cramps them for room. One of the AzhwArs exclaim "What is happening? We thought there were only 3 of us? But it looks like there is more people here. We have to light a lamp to see who else is present." (bhagavAn has great attachment towards his devotees even when they are alone, what to speak of his joy when he sees his devotees together). poigai AzhwAr lights a lamp highlighting bhagavAn as the lord of both spiritual and material worlds, bhUthathAzhwAr lights a lamp of devotion and pEyAzhwAr visualizes the presence of bhagavAn with that light. It is as if, all 3 stages occur in the same personality. That is, first we acquire valid knowledge, then it matures into devotion and finally it results in the divine vision. In vyAkaraNam, even though pANini, vararuchi and pathanjali have written vyAkaraNa sUthram (source), vruththi (brief explanation) and bhAshyam (commentary), because they all talk about the same thing, all 3 are considered as a single object of knowledge and are called as "thrimuni vyAkaraNam" (vyAkaraNam of 3 sages). Similarly, even though there is karthru bEdham (different authors) for the 3 thiruvanthAdhis, they can be said as one. poigai AzhwAr lights a lamp with the understanding that "anything other than bhagavAn is property for him and bhagavAn is the propreitor". bhUthathAzhwAr lights a lamp with the devotion that was acquired from that knowledge. pEyAzhwAr enjoys the result of that bhakthi - bhagavath sAkshAthkAram (divine vision of bhagavAn). Not only they enjoyed this wonderful bhagavath vishayam themselves, they also documented their experience in 3 dhivya prabhandhams namely mudhal thiruvanthAdhi, iraNdAm thiruvanthAdhi and mUnRAm thiruvanthAdhi to share this experience and uplift others. Let us understand what is meant by thagaLi (தகளி) - earthen lamp, ney (நெய்) - ghee and viLakku (விளக்கு) - light. jagath (worlds) is explained as "sAvayathvAth kAryam" (ஸாவயத்வாத் கார்யம்) - that which has parts is called effect. If there is "effect", that must have been created by some one. As the effect is variegated and marvellous, the creator (cause) should also be very powerful and marvellous. Here bhagavAn is highlighted as the one who holds sankam (conch) and chakram (disc). A question arises here. bhAshyakArar condemned AnumAnikars (one who establish brahmam (supreme god) through anumAnam (inference)) and explained that brahmam can only be established by sAsthram while commenting on brahma sUthram 1.1.3 "sAsthrayOnithvAth". Why is poigai AzhwAr establishing brahmam based on anumAnam (i.e., as there is variegated creation there must be a powerful creator)? That is explained through manu smruthi 12.106 "Arsham dharmOpadhEsam cha vEdhasAsthrAvirOdhinA, yastharkENAnusandhaththE sadharmam vEdha nEthara:" (ஆர்ஷம் தர்மோபதேசம் ச வேதசாஸ்த்ராவிரோதிநா, யஸ்தர்கேணானுஸந்தத்தே ஸதர்மம் வேத நேதர:) Those who analyse the vEdhams which were understood by sages and the smruthis which establish religious practice - only such persons understand dharmam and others do not. So, inference which is contradictory to vEdha sAsthram is condemned. But inference which is favourable to the views of vEdha sAsthram is accepted. So, inference on brahmam here which is in line with sAsthram is accepted. In the beginning of srIbhAshyam, it is said that "nyAya anugruhIthasya vAkyasya arththa nischAyakathvAth" (ந்யாய அநுக்ருஹீதஸ்ய வாக்யஸ்ய அர்த்த நிச்சாயகத்வாத்) - Only those sentences which are in line (blessed) with nyAya (logic) have the capacity to establish the real meanings. Thus ends nampiLLai's introduction to mudhal thiruvanthAdhi. Let us briefly see the thaniyan for mudhal thiruvanthAdhi which was composed by mudhaliyANdAn. 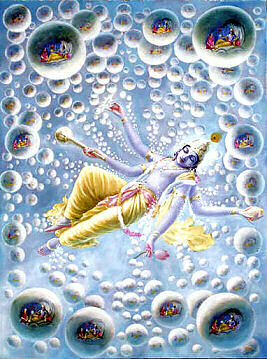 thaniyans usually reveal the glories of the author of the prabhandham and the prabhandham itself. Simple translation: poigai AzhwAr appeared in the beautiful kAnchIpuram (thiruvekkA) dhivya dhEsam which is surrounded by gardens. A leader among poets, out of affection towards the devotees of srIman nArAyaNan for their upliftment, he composed 100 beautiful thamizh pAsurams in anthAdhi style to establish the divine principles in a comprehensive manner.